Heat a large, deep nonstick skillet over medium-high heat. Add 1 tablespoon EVOO to the pan and brown the sausage in it. Transfer sausage to a paper towel-lined plate. Drain fat from skillet and return pan to the stove. Add the remaining tablespoon EVOO, followed by the garlic and onion. Sauté 3-5 minutes until the onions are tender. Add bay leaf, sage and wine to the pan. Reduce wine by half, about 2 minutes. Add stock and pumpkin and stir to combine, stirring sauce until it comes to a bubble. Return sausage to pan; reduce heat and stir in cream. Season the sauce with the cinnamon, nutmeg, salt and pepper, to taste. Simmer mixture 5-10 minutes to thicken sauce. Return drained pasta to the pot you cooked it in. 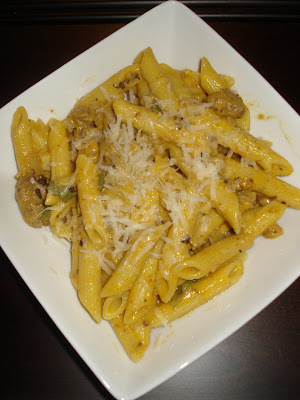 Remove the bay leaf from sauce and pour the sausage pumpkin sauce over the pasta. Combine sauce and pasta and toss over low heat for 1 minute. Garnish the pasta with lots of shaved cheese and sage leaves.